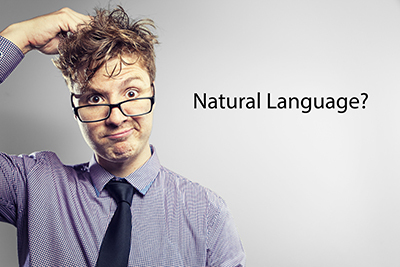 Pronexus VBVoice IVR Blog | Natural Language: What the Heck is That? Natural Language: What the Heck is That? Innovation at the speed of light. Every day new products continue to become an integral part of our daily lives that were unheard of five years ago (think Keurig, rear park assist, Uber). The speech technology industry is not immune. We look aggressively to the future, and often innovation in speech moves faster than the creation of words used to describe it. We end up with words created, defined and redefined until the dust settles and ultimately these new words become part of our vernacular. This neurotic pace often breeds confusion. One current example is the use of the term “natural language”. Recently at SpeechTek in Washington this term was thrown around to mean a multitude of things. The most problematic definition? “A natural-sounding interactive voice response solution.” Beware! Natural Language differs greatly from a natural sounding IVR! Here is the problem. Natural language is far from merely a conversational IVR; it is a speech or text based system that is designed to be able to answer any question asked of it in any form by recognizing keywords and matching keywords with a response, the most famous example being Apple’s SIRI. The artificial intelligence and algorithms built into a natural language platform are extensive and expensive! They rely on thousands and thousands of hours of programming for anticipated utterances, and thousands and thousands of hours of monitoring and tuning to account for human behaviour once the natural language solution is in place. Why is this confusion in definition currently a problem? When management asks their customer service team to investigate a natural language IVR, they may not realize that they are asking for a system that will cost hundreds of thousands of dollars, and take years to build. Even if these systems reach the deployment stage, the results can be frustrating for users if the engineers have not thought through every possible question the user may pose, or if the system recognizes a keyword but draws the wrong conclusion. Be an educator! When you hear “natural language” being used loosey-goosey around the boardroom table in place of what is really meant – a well-designed directed dialog IVR with ASR and specific database look ups that provide an amazing personal user experience – stand up and proclaim the value of a natural-sounding IVR experience, with call flows that are based on real-life conversations. Best of breed IVR developers use keen script development to keep the call moving forward, and they fine-tune their automatic speech recognition to ensure that the end user can use only their voice to interact with the system. Leave natural language to the companies that can afford to make it work well (think Google, Apple and IBM); for 95% of us, expertly designed and deployed directed dialog IVR solutions are the cost-effective, resource-effective approach that offers the best value and the best end user experience. How have you come in contact with the concept of natural language? Let us know! Not sure what a good directed dialogue IVR with speech recognition is? Want to provide your customers with a personal IVR experience that knows who they are and why they are calling? You’ve come to the right place.